Clorox Co (NYSE:CLX) was founded in Oakland California in 1913. The company is still headquartered in Oakland, and currently employs around 7,700 people. Since 1913, Clorox has grown significantly. The company now has a market cap of $15.8 billion. The company is remarkably consistent. Clorox has increased its dividend payments for 38 consecutive years and has a history of rewarding shareholders with share repurchases as well. Hedge funds tracked by Insider Monkey were somewhat on the fence concerning Clorox as of June 30. 27 of the more than 730 funds we track were long Clorox, holding stewardship over 5.30% of its shares, which were worth just under $724 million on June 30. Ownership was up by one during the second quarter, though the value of the funds’ collective holdings fell by about 10% (the stock’s dip accounted for half of that, as it slid by 5% during the period). Andy Brown‘s Cedar Rock Capital was one of the bullish hedge funds long Clorox, owning 3.16 million shares and with 8.7% of its public equity portfolio invested in the stock. 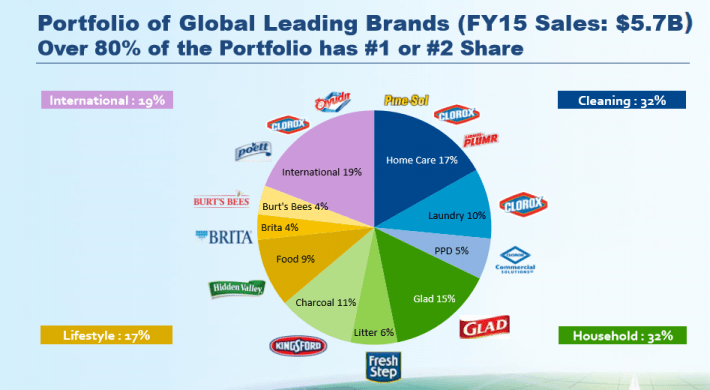 Clorox’ competitive advantage is derived from its strong brands. The company has a long history of building, strengthening, and acquiring consumer branded products. Clorox Co (NYSE:CLX) spends around 9% of its total sales a year directly on advertising. The company’s large advertising budget helps it to sell its products for premium prices by highlighting the specific benefits of its products. In addition to build up brand equity through advertising spending, Clorox also spends significantly on research and development. The company is constantly attempting to improve its products to better serve its customers. Clorox has spent about $130 million a year on research and development over the last 3 years. Clorox’ full competitive advantage is a combination of its well-known brands, economies of scale and efficient supply chain, and its focus on product improvement through research and development.